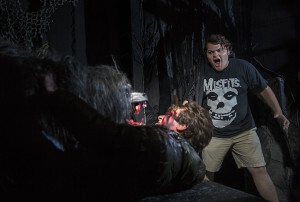 The return of the fan-favorite house, based on John Landis’ critically-acclaimed horror film, An American Werewolf in London – a fiercely-immersive experience that pays homage to one of the greatest lycanthropic stories ever told. This year, the wolves are more ferocious and hungry for human flesh… and their pack has expanded. All-new, original houses based on the best and most iconic stories from years past, including ghastly scenes from RUN: Blood, Sweat, and Fears, Asylum in Wonderland 3D, Body Collectors: Recollections and Jack Presents: 25 Years of Monsters and Mayhem. More “scareactors” than ever before in five spine-chilling, new scare zones, including the escaped inmates from Psychoscareapy – Unleashed, appearances from past event icons including The Caretaker, The Storyteller, The Director, and The Usher in ICONS – HHN and more. Two outrageous live shows, Bill and Ted’s Excellent Halloween Adventure and The Carnage Returns­—featuring the favorite and feared icon Jack the Clown. On select nights Sept. 18 through Nov. 1, guests can visit Universal Orlando’s theme parks by day and by night, become victims of their own horror film at Halloween Horror Nights 25. For more information on Halloween Horror Nights 25, including offers and vacation packages, visit www.HalloweenHorrorNights.com/Orlando. This entry was posted in Haunted Attractions, Home Page, Home Page Slider, News and tagged An American Werewolf in London, Halloween Horror Nights, Halloween Horror Nights 25, Universal Orlando. Bookmark the permalink.